This Bundle has our Emax Industrial Plus 7.5 HP 2 Stage V4 1 Phase Vertical 80 Gal. Piston Air Compressor is designed for up to 50,000 hours of commercial or industrial use with proper maintenance. We have paired it with our environmentally friendly 30CFM Refrigerated air dryer. 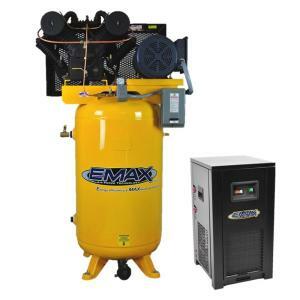 Emax compressor has made it easier for you to select the equipment you need, whether you are working out of a garage or an industrial environment we have what you need. We have taken the guess work out of pairing the perfect refrigerated dryer by introducing our bundle packages. Emax has paired these dryers to fit the CFM requirements of the compressor you have chosen saving you time, money and giving you peace of mind. Tbook.com crawls the web to find the best prices and availability on Industrial Hardware and related Tools and Hardware products like EMAX Industrial PLUS Series 80 Gal. 7.5 HP 1-Phase 2-Stage Stationary Electric Air Compressor with 30 CFM.... For this page, related items include products we find that match the following keywords: "Industrial" at our vendor partner Home Depot. EMAX Industrial PLUS Series 80 Gal. 7.5 HP 1-Phase 2-Stage Stationary Electric Air Compressor with 30 CFM... is one of 143 Industrial Hardware and related products listed in the Tools and Hardware section of Tbook.com If you have any questions on this product, please give us a call at 734-971-1210 during the hours of 9am - 5pm EST for assistance. Thank you for shopping at Tbook.com, the Internet Department Store!